Tanaka Shihan was a senior disciple of the founder of modern Aikido, Ueshiba Morihei, and is currently a 9th dan in this style. He also received the Menkyo Kaiden from Kuni Zenya of Kashima Shinryu for Kenjutsu and Taijutsu (sword and body techniques). He has studied deeply in Chinese classics, modern Japanese history and Shinto history. Within Budo he has trained firstly in Aikido but also in Judo, Karate, Kendo, Kashima Shinryu Kenjutsu and many Ko Budo (classic martial arts). Tanaka Shihan is also a 9th Dan in Butokuryu Aikijujutsu. For a period reaching over 50 years, Tanaka Shihan has taught many people in the political, economic, administrative and education worlds while acting in the office of the Shihan of Aikido first at The University of Tokyo, and then Chuo University, Senshu University, Kanazawa University, and Toyama University, as well as in the office of the Principal of the Meiji Jingu Budo Dojo Shiseikan (now emeritus principal). 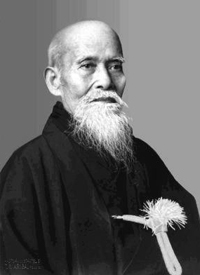 Tanaka Shihan is the only living member of the Aikido world to receive the Mokuhai from the Japanese government for recognition of his level of achievement in Budo. He continues to teach in Japan and Europe and has taught at 'Aikido Union England' seminars in the UK since 1992. Master Stratford studied Judo whilst in the Armed Forces and competed in many competitions. After witnessing an Aikido demonstration he set about his study by travelling extensively around Europe. He has studied under many noble Sensei including: Minoru Mochizuki, Hiroshi Tada, Kenshiro Abbe and Tadashi Abe.Whilst studying at Sussex University he met Norio Tao, now 7th Dan, who in turn introduced him to Master Shigeho Tanaka.They have remained great friends from those days and Master Stratford has visited his 'brothers' in Japan and on many occasions they have travelled to see him in the U.K.
Master Stratford has been honoured twice by the Japanese Government in his life to date.The latest of which was the bestowal of the 'Order of the Rising Sun' Gold & Silver Rays upon him in a special ceremony at the Japanese Ambassadors Residence, Kensington Palace Gardens, London. Master Stratford is the only 'Budo Sensei' outside of Japan to receive such a high level of the 'Order of the Rising Sun'. Sensei John Gaynor has trained in Martial Arts since 1980. His love for Aikido became obvious when he began training under the late former Vice President of the A-U-E Sensei Chris Mcdonald 6th Dan, former Secretary to the A-U-E Sensei Janet Mcdonald 4th Dan as well as his weekly private lessons with his friend the late Sensei Charlie Hall 3rd Dan who introduced John to Aikido. He still remains under the guidance and Instruction of Master Pat Stratford 8th Dan and has also trained under Master S.Tanaka 9th Dan, Master N.Tao 7th Dan and guest Sensei from Japan whilst they visited the Aikido Union England to conduct seminars. John has over 15 years experience of Frontline Security within the East Midlands, U.K. which has put a very practical angle into his Aikido. He is also a qualified O.C.F.M. International coach and P.P.D.T. Senior Instructor under Master Russell Stutely (Europe’s number One Pressure Point Expert).